Sewing skills and techniques for beginners and more experienced sewers. All levels welcome! Beginning sewers will learn basic skills and techniques and those with some experience will improve their skills and learn tips and tricks. Beginners - if you're a beginner, you'll start by making a lined bag, which teaches all the basic skills involved. After that you'll move on to a project of your choice, in consultation with the tutor. A list of materials and equipment to bring (e.g. fabric, scissors, pins etc) will be sent out when course numbers are confirmed. If you're a returning student, or have already mastered the basic skills, you'll work on your own project so please bring along whatever you're working on (or something new) and your sewing kit to the first session. 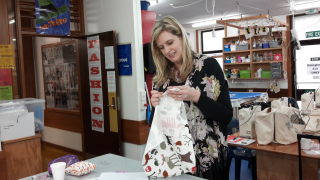 By the end of the course, you'll have been introduced to basic skills in dressmaking, if beginners, or further skills for the more experienced. • (In addition), use a variety of advanced sewing techniques e.g. rolled hems, various zip insertions (invisible and standard), make buttonholes or line garments. Machines provided but if you bring your own, we recommend an Electrical Compliance Certificate for all privately owned electrical equipment used on courses at Wellington High School.